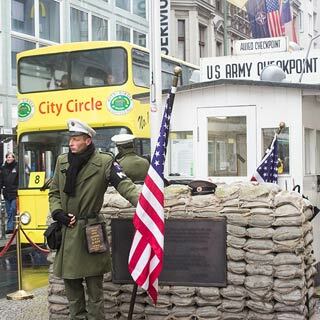 Start or interrupt your hop-on hop-off sightseeing tour of Berlin at stop Checkpoint Charlie. Checkpoint Charlie was the best-known Berlin Wall crossing point between East and West Berlin. Located in Friedrichstraße, it connected the Soviet with the US sector, thus the East Berlin district of Mitte with the West Berlin district of Kreuzberg.